Philippines - Filipino migrant workers or overseas Filipino workers (OFW) represent a major socioeconomic sector of the Philippines, contributing about USD 21.3 billion of remittances in 2012. In fact, the recent improvements in the country's GDP were largely due the consistent financial flow from these migrants. 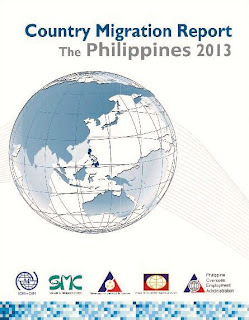 On the heels of this economic growth, the International Organization for Migration today (27 June 2013) launches the Philippines’ first Country Migration Report (CMR), profiling the migration flows of the island nation. 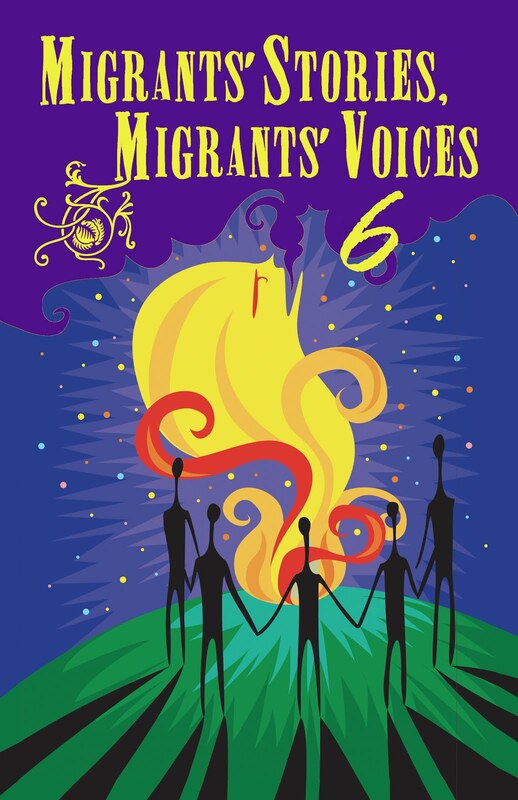 With the Philippines being a prominent origin of migrant labour and permanent migrants to more than 200 destinations worldwide, the 291-page book was drafted in cooperation with 30 contributing organizations, including the Department of Labor & Employment, the Philippine Overseas Employment Administration and the Commission on Filipinos Overseas. The Philippines CMR is the newest addition to more than 40 country migration profiles that IOM has documented since 2007. The CMR, largely authored by the Scalabrini Migration Center, highlights the country’s most comprehensive and integrated account of its migration management profile. The report discusses the Philippines’ migration history, the trends and characteristics of its migration flows, the impact of international migration on various fronts and its migration governance. IOM programme officer Ricardo Casco says the CMR is a good reference for an informed policy as well as responsive service programming and delivery. He says the report was completed through a series of inclusive consultations and data-mapping exercises. Under the Migrant Workers and Filipinos Act, a provision states that there is a need for a shared government information system on migration. “One good thing about the process was to have rekindled the network of institutions who needed to sit together just on the goal of migration data sharing and report integration”, says Casco. The report also brought to light critical analyses of migration issues as well as recommendations on how to address these challenges. "The recommendations point to the need to view migration issues in a larger perspective. The Philippines must take action, through the domestic economy, to positively redirect migration flows – one that will benefit local and regional development," Casco explains. The Philippines CMR also underscores the need for engagement of government institutions that are not traditionally sensitized with any role in migration. The launch was spearheaded by Marco Boasso, Chief of Mission of IOM Philippines, with the keynote address of DOLE Secretary Rosalinda Baldoz and a message from CFO Secretary Imelda Nicolas who shared the lead in mobilizing the inter-agency technical working group. Produced within the framework of the Migration Profile Development Project for the Philippines, the Country Migration Report: The Philippines provides a comprehensive evidence-based account of the country's migration experience in a single, concise document as a tool for policy-making. The CMR was initiated by the International Organization for Migration (IOM) in response to the Philippine Government's interest to take stock of the country's international migration experience and to harmonize migration data management system within a shared framework. 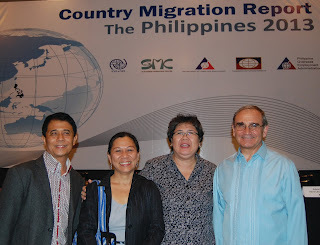 This immediately emerged after the 2011 Global Forum on Migration and Development (GFMD) conference on Migration Profiles co-chaired by the Philippines with Switzerland in Manila. The CMR was prepared in cooperation with Scalabrini Migration Center (SMC) with support from the IOM Development Fund and implemented with its key partners: the Department of Labor and Employment (DOLE), the Commission on Filipinos Overseas (CFO), and the Philippine Overseas Employment Administration (POEA). In addition to summarizing readily available migration data sets and statistics, the CMR aims to: identify and analyze the challenges and critical areas surrounding migration data management; help narrow existing gaps by bringing to light stakeholders observations of the Philippines' current migration experience; emphasize the connection between migration and development and its significance in the country's migration governance framework. Part A – Becoming a country of migration. With a fast increasing and young population, the Philippines has the demographic characteristics of an emigration country. High level of poverty, lack of adequate infrastructure, and an economic development which does not generate an adequate number of jobs contribute to create the economic context for the propensity to seek employment abroad. The demand for workers from fast developing economies in the Middle East and East Asian countries generate a labor migration program, which has continued and expanded because of lack of opportunities in the domestic labor market and a culture of migration which places employment abroad on top of the aspirations of young Filipinos. Part B – Migration trends and characteristics. Since its inception in 1974, the deployment of Filipino workers has constantly increased, reaching in 2012 the number of 1,435,166 for landbased workers and 366,865 for seabased workers. It must be observed that landbased workers include also Filipinos who were already employed abroad and who were rehired after some vacation at home. In fact, the increase in the number of rehires, which was more significant than that of new hires in recent years, indicates that the time spent overseas is getting longer and permanent return to the Philippines is postponed. Migrants originate mostly from Metro Manila and the surrounding provinces. Notable exceptions in this mapping are the provinces of Pangasinan, Cebu and Maguindanao. In the annual outflow the majority are women, who also tend to be younger than men. The Gulf countries are the main destination of Filipino workers (67%), while one third go to Asian countries, in particular Hong Kong, Singapore and Taiwan. Saudi Arabia is always the leading destination country. The top occupations for Filipino workers are service and production. About 80 percent of OFWs are comprised in those two categories. The single most numerous occupation is domestic work. The Commission on Filipinos Overseas estimates that the number of Filipinos abroad reaches approximately 10.5 million, of whom 4.3 million are workers. Perhaps the number of Filipinos permanently abroad (4.7 million) is overestimated, or requires a more precise definition of who is a Filipino abroad. After 40 years, some constants can be established. Migration has experienced constant growth, the time spent abroad is also increasing, the top ten countries of destination have remained almost the same, women normally outnumber men in the annual outflows, occupations distribution is dominated by service and production workers, and domestic work is the top occupation of OFWs. Part C – Impact of migration. Migration affects many people and many aspects political and social realities. Not always sufficient research has been carried out to reach incontrovertible results but some conclusions are generally accepted. Most migrants benefit from migration, but their experience is not without costs. In general, migrants’ families have better housing, better nutrition, better health and better education. Many families, however, also break up because of distance and solitude. At the economic level, migrant families can afford to spend more and come out of poverty level. Some families become dependent on remittances and experience a decrease in labor force participation, but this cannot be generalized. Remittances also increase inequality but it is possible to hypothesize that remittances trickle down to less affluent provinces and communities. To profit from remittances, economic conditions in the country must improve further and generate opportunities for private enterprise and investments. In the labor market, overseas employment reduces to some extent the level of unemployment. At the same time, a close correlation between increase of overseas employment and decrease of unemployment cannot be established. The migration of highly skilled workers did not generate scarcity of skills in the country. There is evidence of brain waste in the migration phenomenon, but data are not sufficient to establish a direct brain drain effect. There is mismatch between education and labor market in the Philippines. There is an oversupply of graduates in disciplines that are not sufficiently absorbed by the domestic labor market. At the same time, migration exercise a distortive functions in the education system, as too many students enrol in nursing and maritime schools without finding deployment abroad. Part D – Governance of migration. The Philippines has adopted comprehensive legislation, covering all aspects of the migration phenomenon. It has also entered into bilateral agreements with various governments; it has been active in the migration concerns at the regional level; and pushed for adoption of instruments at the international level. More attention must be given to the local level, where the decision to migrate is forged and where migrants return at the end of the process. Part E – Main findings, challenges and recommendations. The most important policy decisions to benefit overseas labor are not directed to the migrants themselves but to the country in general, in particular by improving the conditions for national development. Overregulation of overseas labor, forcing migrants of all categories to follow the same procedures, should be avoided. There should be better coordination among government agencies and better training of migration officers. Systematic and periodic consultation among all stakeholders, in the line of the recently started Overseas Landbased Tripartite Consultative Council, should be ensured. Migrants are a resource, not a problem. Efforts should be made to provide them and their organizations adequate capacities. To give migration a better chance to contribute to development, its potential at the local level should be maximized. The connections with the Filipino diaspora should be strengthened, facilitating the formation of business communities among permanent migrants. The diaspora should be informed about development projects in the Philippines and development opportunities should be inserted in the bilateral agreements. Finally, for the management and study of migration improvements should be fostered concerning migration data, beginning with homogenization of definitions, classifications and procedures, to continue with better equipment and training, and common policies and procedures for sharing data among government agencies. It is also desirable to undertake a national survey on migration.